The Lombardi Trophy was on display during a press conference about plans for the Philadelphia Eagles Super Bowl victory parade. Philadelphia Mayor Jim Kenney stands behind the trophy as Philadelphia Police Commissioner Richard Ross speaks at the podium to the left. The Eagles' Super Bowl victory parade will include several surprises as the team makes its way from the sports complex in South Philadelphia to the steps of the Philadelphia Museum of Art, city officials announced on Tuesday. 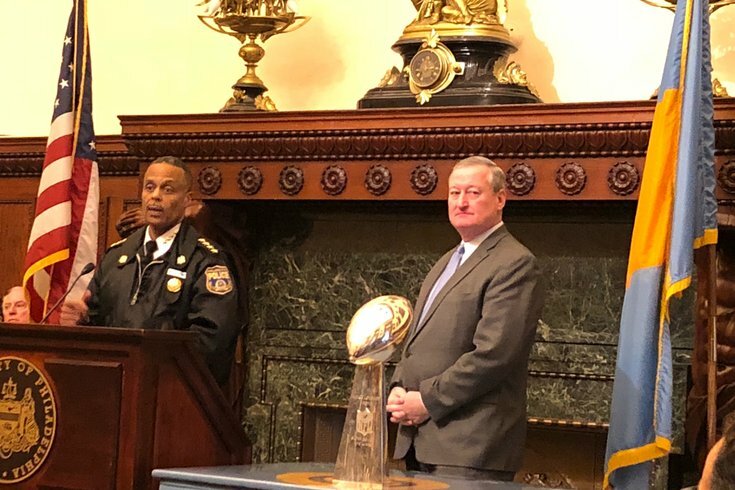 Standing beside the Lombardi Trophy, Mayor Jim Kenney beamed as he unveiled details for the much-anticipated celebration, which will include both a parade up Broad Street and a ceremony at the art museum. With the crowd expected to surpass the Phillies' World Series parade, SEPTA announced free rides on subways and modifications to its regional rail service that resemble those used during the 2015 papal visit. "The entire nation will be watching our Super Bowl celebration," Kenney said. "Let us show them what Philly pride is really all about." The event will take place in two parts. First, the Eagles and team and local officials will be part of a motorized parade beginning at 11 a.m. at Broad Street and Pattison Avenue in South Philly. The Eagles will ride on open-air vehicles, making it easy for fans to see their favorite players as they travel along the parade route. City officials said the parade will move slowly, allowing everyone an opportunity to revel in the moment. "All of our fans, the spectators, will be on the sidewalks, hanging out windows of office buildings, we suspect," said Fred Stein, executive director of The Creative Group, which is coordinating the parade. "There's a couple of surprises along the parade route. They will be very visual." The parade will culminate at the Philadelphia Museum of Art where a ceremony honoring the team will take place on the museum's steps. The ceremony, which will include speeches from Eagles players, is expected to begin at 1 p.m. But those who can recall the Phillies parade know it might take longer than anticipated. Unlike other victory parades, including the 2008 Phillies parade, the Eagles will end up on the Benjamin Franklin Parkway instead of at the sports complex in South Philly. "We've heard numbers and reports of how many people are coming," Stein said. "We know we can't fit 3 million people on the Parkway. A lot of people are going to arrive early to get the best vantage points. They don't necessarily have to worry. We, right now, have 14 jumbotrons that will stretch from Eakins Oval down to City Hall." There will be about 40 food trucks stationed along the Parkway, according to city officials. There also will be 850 porta potties to accomodate the crowd. "It's nice to be a winner," said Kenney, adding that he jumped from his couch after the Eagles forced Tom Brady to fumble in the waning moments of the Super Bowl. "It's nice that this particular team made us a winner. ... It does put things on an upward trajectory. I think it's terrific." The Eagles parade route will follow South Broad Street from Pattison Avenue all the way to South Penn Square (Philadelphia City Hall). The parade will turn left at South Penn Square, head northbound on 15th Street before turning left again on JFK Boulevard. The route continues west on JFK Boulevard until making a right on 16th Street and then a left to head westbound on the Parkway to Eakins Oval and the steps of the Philadelphia Museum of Art, where the ceremony honoring the Super Bowl champions will take place. The map below shows the parade route, as described by the city. Zoom in to see the specific turns and streets it will follow. By ending the parade at the Philadelphia Museum of Art instead of the stadium complex, city officials hope to avoid the crush of people trying to board SEPTA's subways and trains when the event ends. After the Phillies celebration at the stadium complex ended in 2008, fans flooded the subway systems, preventing them from functioning efficiently. SEPTA officials urged fans to take advantage of free rides on its Broad Street and Market-Frankford lines on Thursday, if possible, to help accomodate demands elsewhere on its transit system. The free trips – offered all day – are being covered by Independence Blue Cross. Subway riders should be advised that trains will only be stopping at a limited number of stations. City Hall and 15th Street stations will be closed on Thursday due to the sheer number of people who will gather outside them. Likewise, the Walnut-Locust Street Station could close at some point, too. Regional Rail lines will operate inbound-only in the morning and then out-bound only in the afternoon. Riders will be limited to boarding at 37 outlaying stops, a setup similar to the 2015 papal visit. Service will be available to Jefferson and 30th Streets stations only. Those stops are located within a short distance of the parade route. Trains will not stop at Suburban Station, University City or Temple University. On the Regional Rails, only pre-purchased passes and senior reduced fares will be accepted. SEPTA is selling discounted Independence Passes for $10 beginning Tuesday, and there will be extended sales office hours on both Tuesday and Wednesday. Out-bound service will take effect sometime between 1:30 p.m. and 2:30 p.m. Passengers must board at the same station where they departed in Center City. SEPTA will be able to accomodate about 500,000 riders on Thursday, General Manager Jeff Knueppel said. That means if the Eagles celebration draws 2 million fans, SEPTA can only accomodate 1 in 4 fans. Philadelphia police said the perimeter of the parade will be secured and protected, and there will be a strong police presence throughout the event. But fans will not need to pass through metal detectors. Commissioner Richard Ross said the parade will be more family friendly than the celebrations that occurred in the hours after the Super Bowl concluded on Sunday. Most Eagles fans celebrated peacefully by hugging strangers, offering high fives and screaming Eagles chants. But police are still working to arrest people for a variety of incidents. Those attending the parade were advised not to leave any bags unattended. If a parade-goer comes across a suspicious bag or person or sees suspicious activity, he or she should call 911 or notify a nearby police officer immediately. The Philadelphia Fire Department will establish medical tents along the Ben Franklin Parkway on the south side at 24th Street and north side at 21st Street. The School District of Philadelphia already has closed city public schools Thursday, and the Archdiocese of Philadelphia announced its schools in the city and suburbs will be closed, as well. Some suburban districts also are canceling class for the day. Philadelphia Eagles president Don Smolenski said Tuesday, "Really the parade is a chance for us to say thanks to Philadelphia for everything."